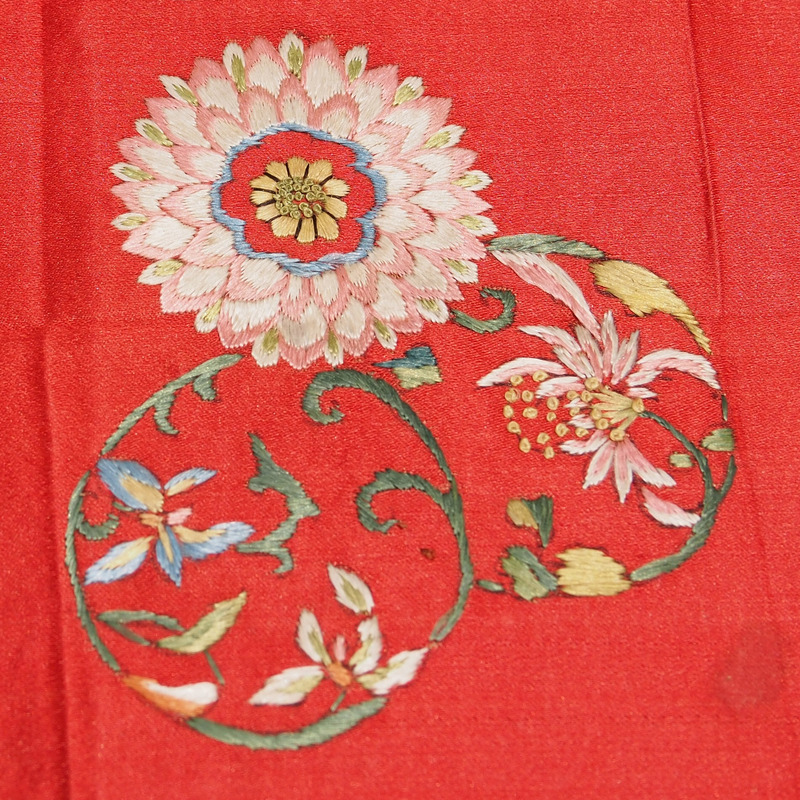 This embroidery was taken from a du dou, a traditional Chinese under garment. 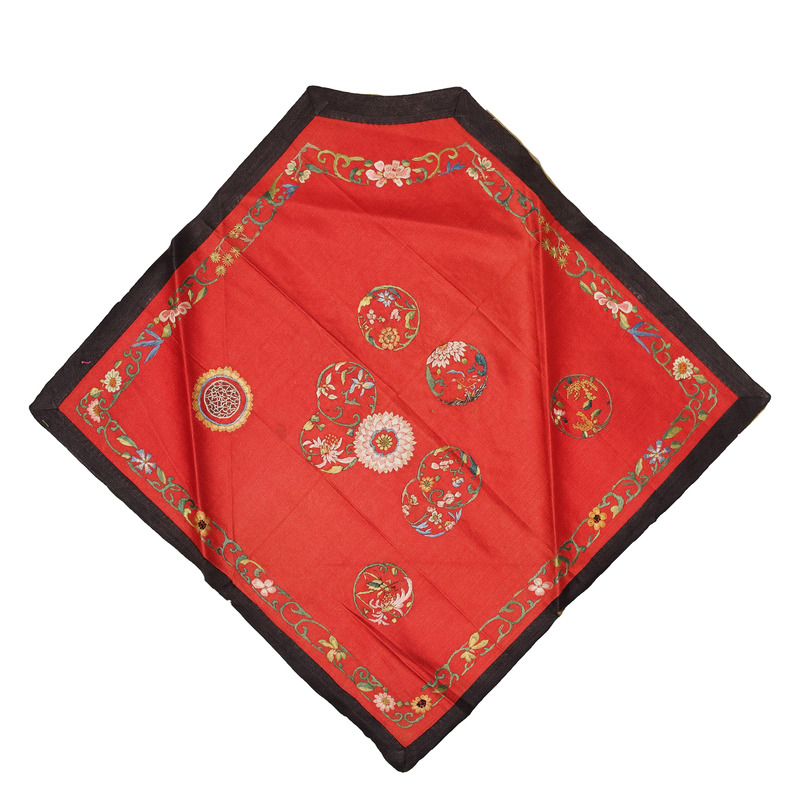 Du dou for men and children are mostly decorated with embroidery, normally by the mother or the lover. 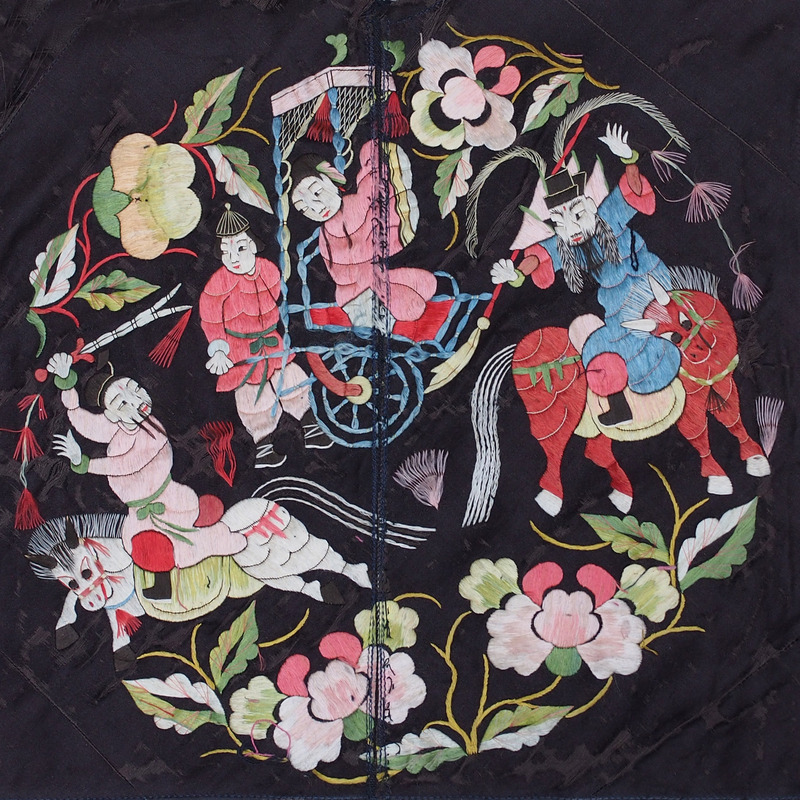 This embroidery is one from the mother to the child, the pattern of the embroidery is filled with object of blessing. In the middle is a TIGER, representing bravery. This is a butterfly embroidery hat for a new born baby, before a child is born the grannies will prepare a hat for the new comer. A tiger hat for the boy and a butterfly hat for the girl (there was no ultrasound then, so I suppose they will have to make one of each, just in case). Butterfly symbolizes beauty, a wish for the family for the young baby girl. 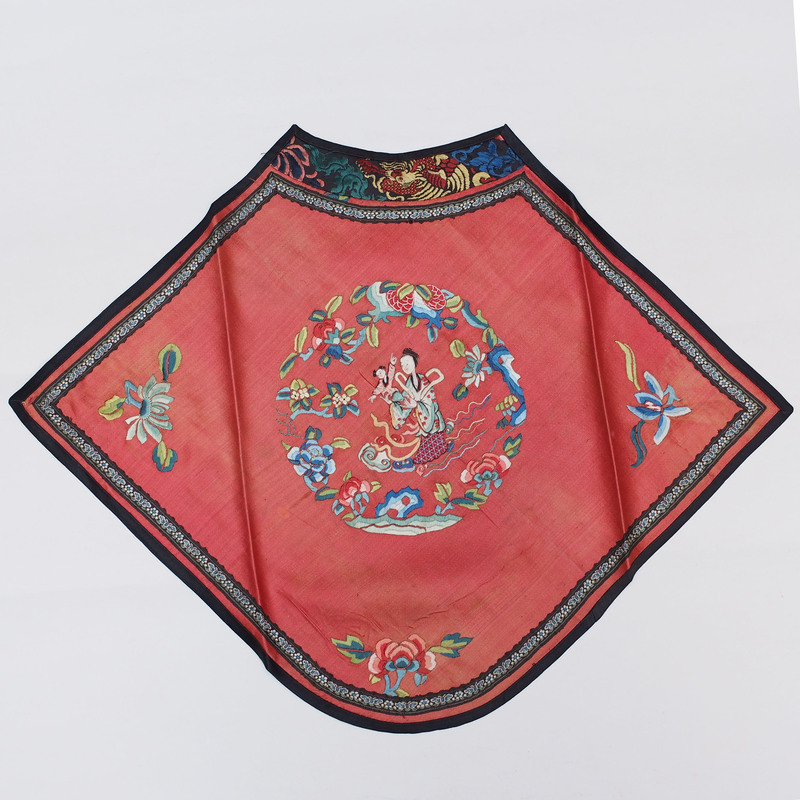 This silk embroidery painting is a traditional gift for birthday of a lady of high social status. 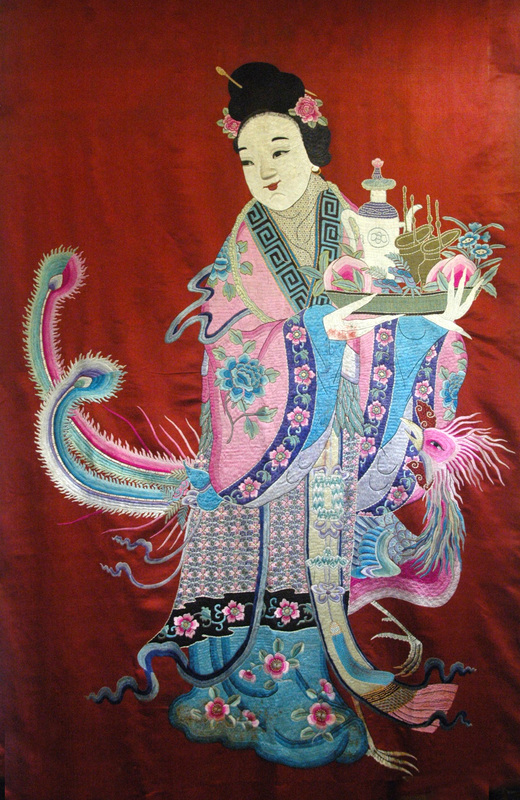 In figure in the embroidery is the saint Ma Gu and the phoenix (queen of all birds) going to give her best wishes the Queen Mother of the West (the supreme head of all female saints) for her birthday. On the tray that she is going to present to the Queen Mother has a few of the magic peaches which are believed to take 3000 years to flower, 3000 to bare fruits and another 3000 years to ripe, a bite of it will make one immortal. 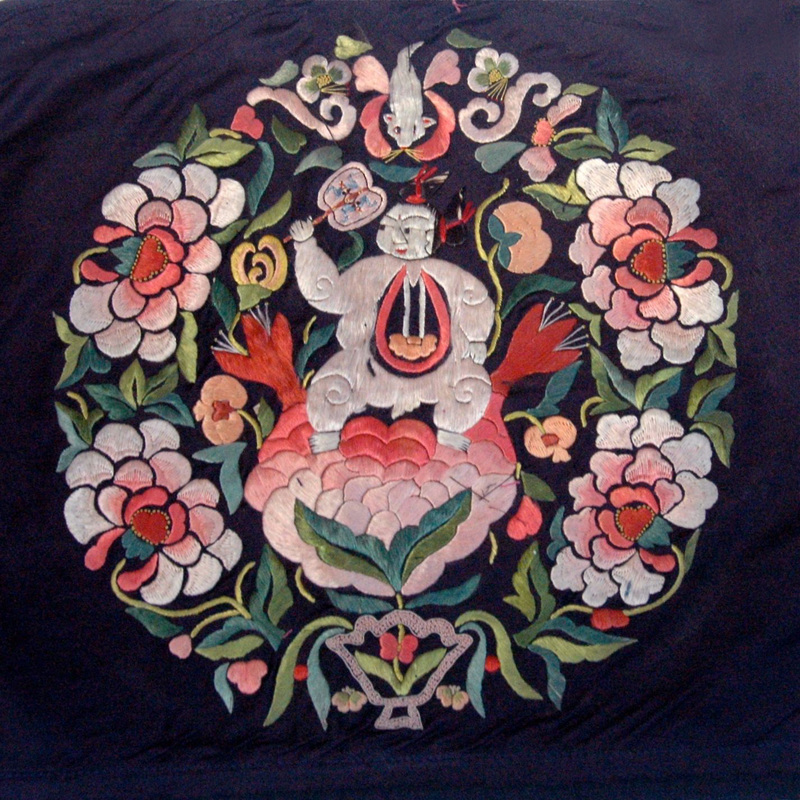 The peach is a symbol of longevity, it was also featured in God of Longevity. Unfortunately the closest we can get to the magic peach is through pottery, carving and paintings, but if you would like to try the worldly version, it is known as the Saturn Peach (Prunus persica f. compressa), they will not make you immortal but they are super delicious. 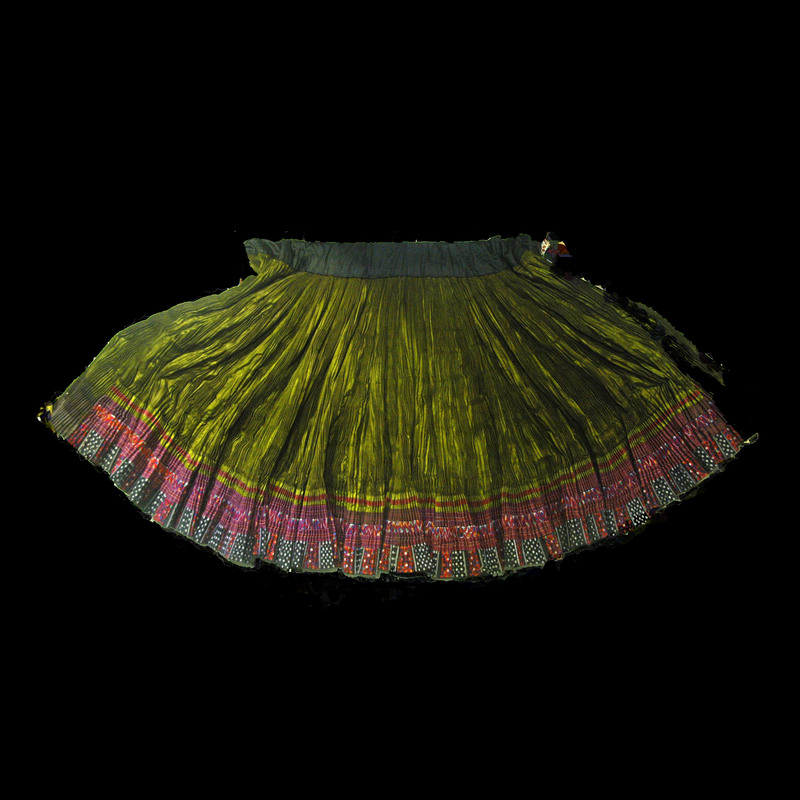 The pleated dress is part of the female Miao tribe costume. The legend of the pleated dress goes like this; once upon a time, there was a handsome Miao hunter, one day he caught a beautiful golden pheasant and he gave it as a gift to the girl he was in love with. 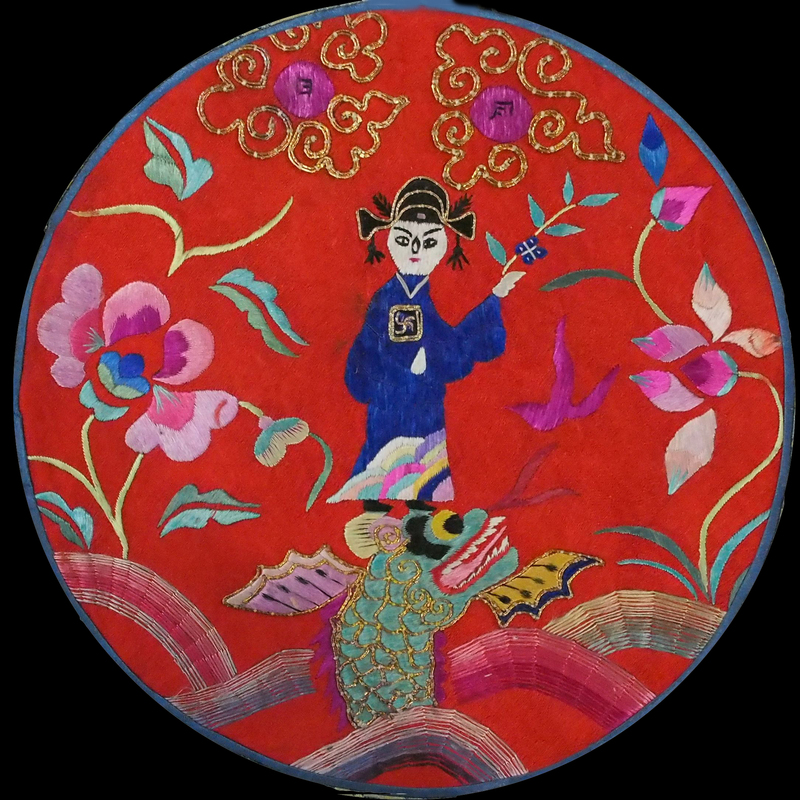 The girl, Ah Beng, looking at the golden pheasant and decided to make herself as beautiful as the bird, so she weaved a cloth added embroidery and made herself a pleated dress. The neighbors saw how beautiful she looked and soon everyone started dressing with amazing pleated dresses. 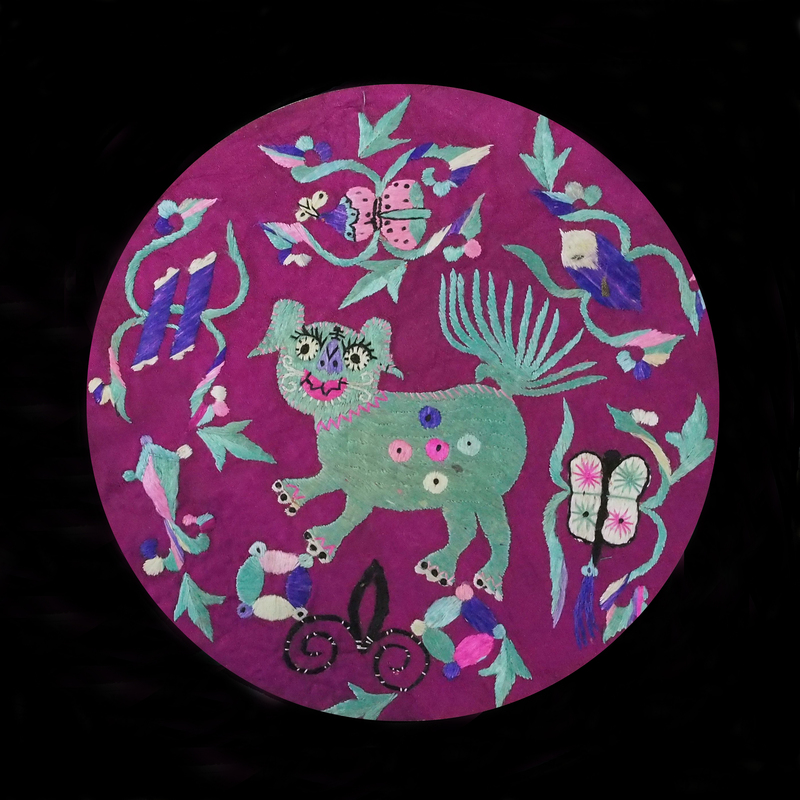 This small piece of silk embroidery (which we have framed) was taken from a children’s underwear (Du Dou). 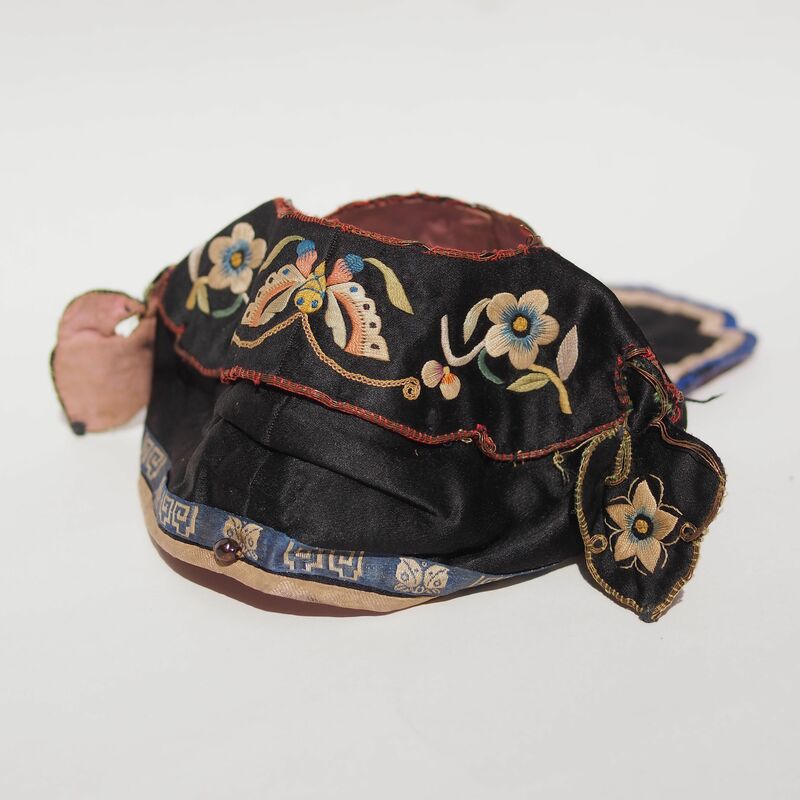 The Du Dou is an undergarment for cover the chest and tummy, its a rectangular or square piece of cloth to be worn diagonally with the top corner trimmed for the neck. 2 strings affixed to the top corner is tied around the neck while the 2 strings attached to the side corners are tied around the back. 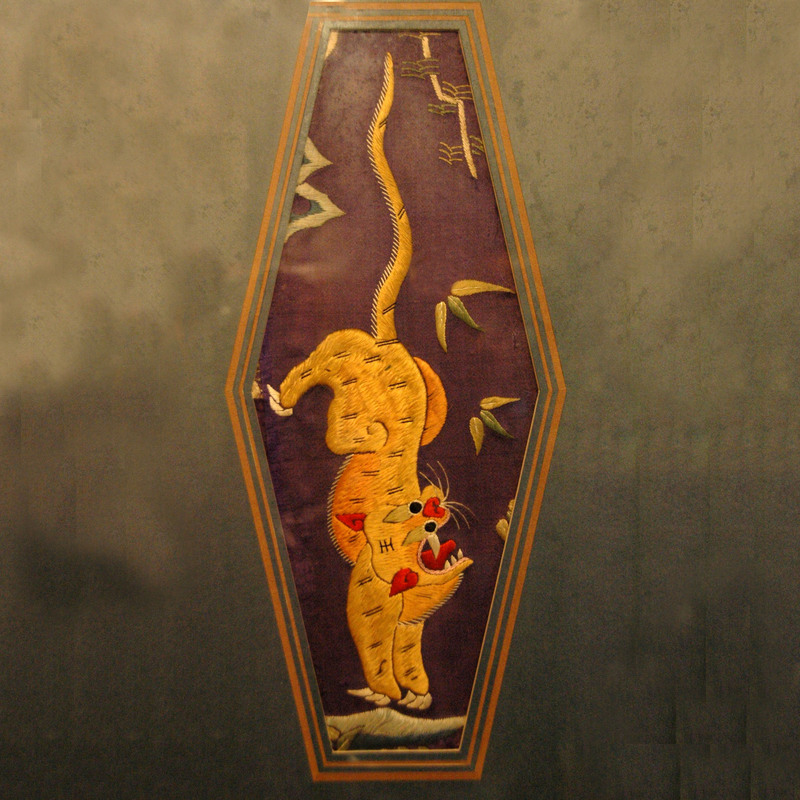 The embroidery patterns for children are of the theme of blessing; tiger is one of them. Tiger is seen as an animal of strength and power, it has been worship for its protection; it is believed that evils will be frighten away when embroidery that has been wrapped around a child. 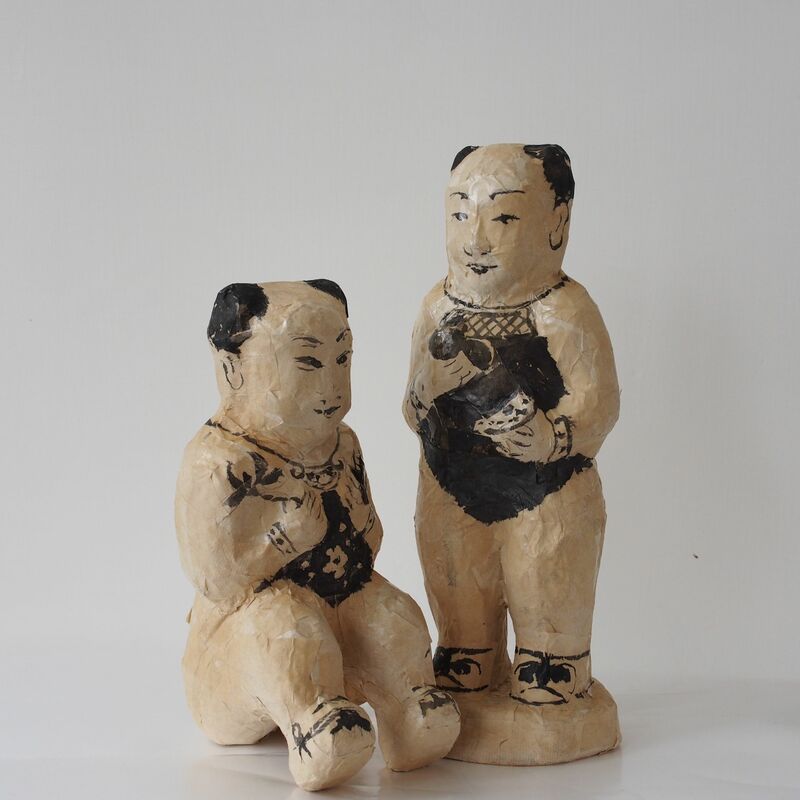 The tiger Du Dou is traditionally worn by all the children and babies on Duan Wu (the day of ills).